A Missouri man with an extensive criminal record was airlifted to a St. Louis hospital for treatment of injuries sustained when he drove away from the scene of an attempted vending machine theft in Waterloo at a high rate of speed and crashed on South Market Street near Route 3 around 6:30 p.m. Sunday. Waterloo Police Chief Jim Trantham said the 52-year-old Wentzville man — who has multiple active warrants out for his arrest in Missouri — was responsive at the crash scene but had suffered serious injuries after being ejected from the 2014 Volkswagen rental car during the crash. The man sped away from Sure Shine Auto Wash, 702 N. Market Street, after police and the owner of the business encountered him about the attempted theft of coins from a soda machine caught on security video. 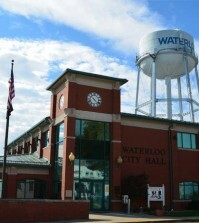 Charges are pending, and Columbia police said two vending machine thefts there “could be related” to the Waterloo case. 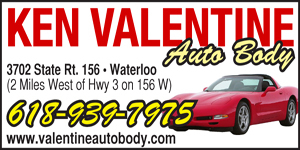 A responding Waterloo police officer approached the suspect at the car wash, Trantham said, but the man got in his car and drove away at a very high rate of speed south on Market Street, turning off the car’s lights to evade detection. The officer briefly gave chase, and another responding officer traveling northbound on Market Street saw the suspect vehicle pass by him heading south. Trantham said his officers halted their pursuit due to the dangerously high rate of speed the car was traveling through town. The Volkswagen continued south on Market Street and went off the roadway at a curve near Route 3, traveling an estimated 200 feet or more in the air before landing and flipping end over end multiple times in a field. Trantham said a paramedic who witnessed the crash came to the quick aid of the driver and an ARCH Air Medical Services helicopter was contacted. “I’m just glad nobody got in his way while he was driving like that,” Trantham said. Evidence was collected at the crash scene and also recovered from the suspect’s clothing at the hospital, the chief added. Monty Wolfe, owner of Sure Shine Auto Wash, said he was watching a live surveillance video feed of his business from home when he observed the man attempting to break into a soda machine and called police. Wolfe arrived at his business around the same time as police, and witnessed the suspect get into the car and narrowly avoid striking a patrol car while speeding out of the parking lot. A lock was removed from the soda machine, but no money was taken, Wolfe said. “If I wouldn’t have been paying attention at that time, he probably would’ve taken everything I had,” Wolfe said. Wolfe told the Republic-Times that after speaking with an employee who had worked there that day, it was discovered the suspect had visited the car wash Sunday morning and again early Sunday evening just prior to the theft attempt. On at least one of these visits, an African American woman was also inside the vehicle. The car wash employee told Wolfe after the fact that the man seemed suspicious and appeared to be under the influence of drugs. “He just wasn’t right,” Wolfe said of the suspect. After looking back at the surveillance video, Wolfe said he could determine that the suspect was taking pictures of various locks on coin and vending machines at the car wash during the morning visit. Late Monday afternoon, the Monroe County Sheriff’s Department — which investigated the crash — identified the suspect as David T. Albrecht of Wentzville.